The Motorola RDU4100 is a great two way radio because it has a lot of power at 4-watts and has outstanding speaker quality coupled with incredible battery life. The Motorola RDU4100 will cover about 350,000 square feet and 30 stories in most situations. 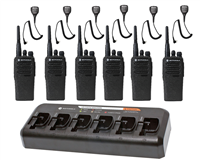 For smaller office complexes, the Motorola RMU2040 6 Pack Two Way Radio Bundle could also work. The Motorola RMU2040 will provide up to 250,000 square feet of communication. The HKLN4604 Swivel Earpiece and the HKLN4599 Earpiece both offer simple push-to-talk communication for your Motorola RDU4100 and RMU2040 two way radios. Earpieces allow you to have private, discrete conversations without being distracting and can be worn by multiple users. Monitoring security at a large office building or office complex requires a lot of organization and awareness. With so much going on in and outside of the building, it is important to have clear communication and to have the ability to quickly alert coworkers and office residents or any emergency situation at hand. Two way radio walkie talkies give you the ability to notify everyone of a security alert at one time with the push of a single button. This puts safety at the forefront. Using earpieces or other audio accessories allows for discrete communication so as not to distract other workers. Communicating across floors and even to other buildings is made easy with two way radios. You can depend on security two way radios to keep you and the entire building safe and functioning properly, whether it means alerting others of a threat or cleaning a spilled drink.